Each session is preceded by an in-person or phone consultation, during which we establish your needs and start to develop a relationship which will be the foundation of our session together. My goal is to achieve a level of comfort with you so that you arrive to the session relaxed and your true self shines through. Eleanor will also be there during the consultation to guide you through the process, tell you what to expect, and to answer your logistical questions.Portrait sessions begin in our centrally-located studio, which features a hand-painted canvas backdrop and staging for images that convey either a rustic charm or a regal dignity. After the indoor fine art portrait session is complete, we move on to one of the many scenic outdoor locations within a short driving distance of Antigonish for an environmental portrait session. At this point, my lighting assistant will join us and you’re welcome to invite members of your extended family to join in the session.This is your family portrait session and our priority is to ensure that it’s comfortable and conducive to producing the best family portraits you’ve ever received. As a photographer, it’s my responsibility to ensure that your posing is natural but refined, and we work together for each photograph. Each image that you receive is a work of art. Our final product is worthy of the effort that we commit to the session and a reflection of the love that you, my clients, hold for one other. 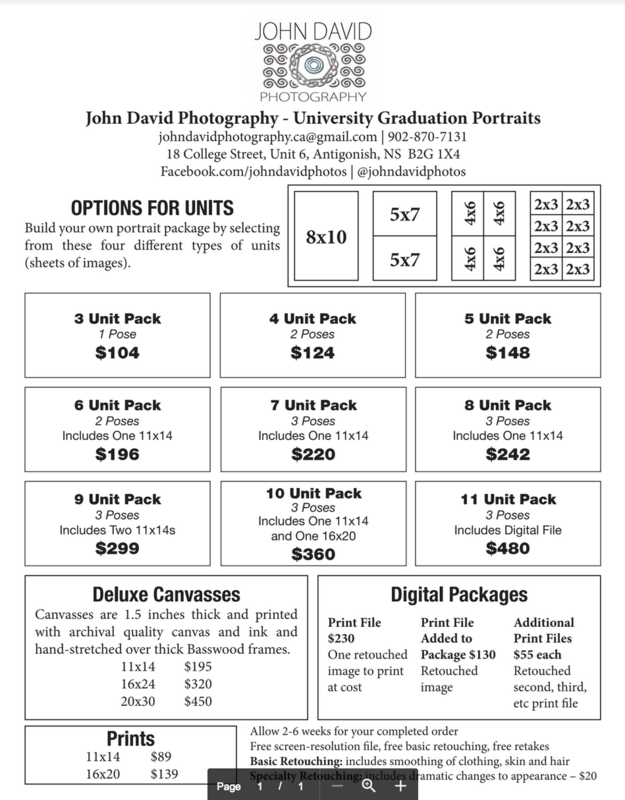 Customize a wedding portrait package to suit your needs. Each session includes optional wardrobe changes and one retouched digital file. Additional digital files are $30 each. * Screen resolution images will look great on any screen and will upload and email easily, but can’t be printed. Print resolution images will look great printed at any size your wall can handle, but will be too large to upload for online use.